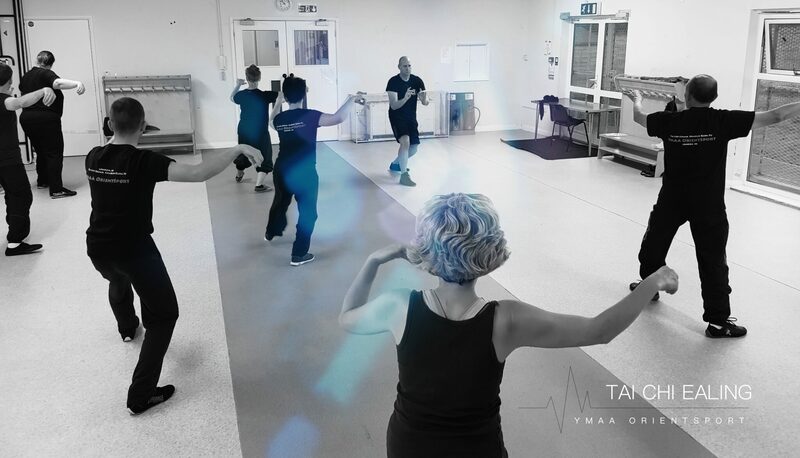 “ Taijiquan is an internal style of Chinese martial arts. All Chinese martial styles, after a thousand years of practice and experience, understand that in order to have an effective way of fighting, they must acquire the four skills of kicking, striking, wrestling, and Qin Na. The skills of kicking and striking are good for subduing Qin Na, wrestling is good to conquer kicking and striking, and Qin Na can be used against wrestling. Four of them mutually compensate and support each other. If there is one missing, then the art is not complete. It is for this reason that every Chinese martial style emphasizes the practice of the techniques of kicking, striking, wrestling, and Qin Na that are used to match the internal Gong’s (i.e., internal Gongfu) practice. However, these four skills are the external manifestation of the internal understanding (i.e., mind) and Qi. 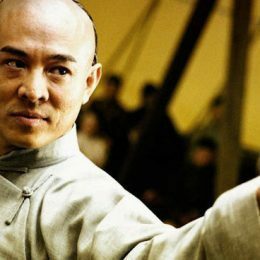 Therefore, all Chinese martial artists must also cultivate internal understanding of the arts and learn how to build up the Qi to an abundant level. When this Qi is led by the mind to the physical body for manifestation, its power can reach to a more highly efficient level. That is why it is said: “Internal and external are unified as one” (Nei Wai He Yi,). Gong means Gongfu. Any study or task that will take a great deal of time and effort to accomplish is called Gongfu. “ Kicking, striking, wrestling, and Qin Na are shaped externally. The effectiveness of their applications is a function of the depth of the internal Gong’s cultivation. What is internal Gong? It involves using the Yi to lead the Qi, so that it can be manifested externally. Because of this, all styles also emphasize the practice of internal Gong’s breathing and using the Yi to lead the Qi. 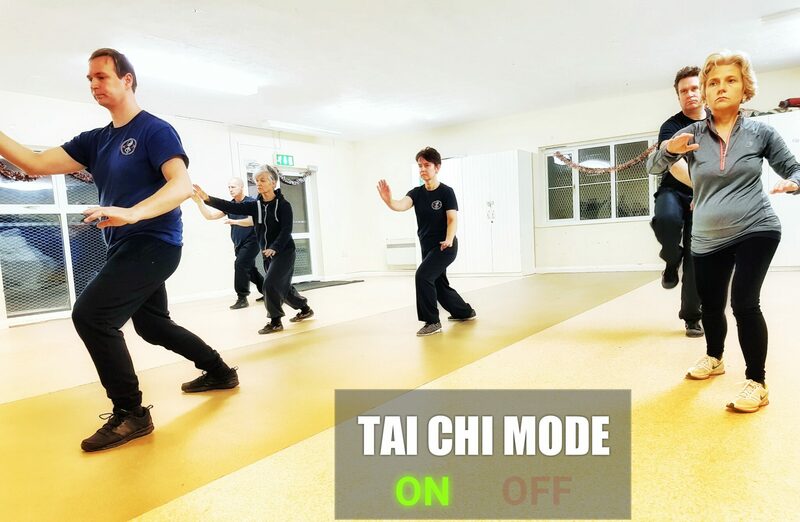 Thus, Taijiquan practitioners should practice both internally and externally; only then can (they) reach the profound understanding of the Taijiquan essence. “ To stick means to attach. It means to get contact and then stick and connect. 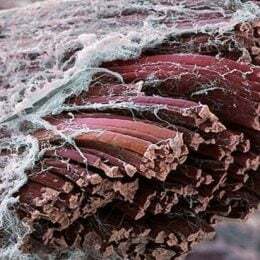 To adhere means to stick together without separating. 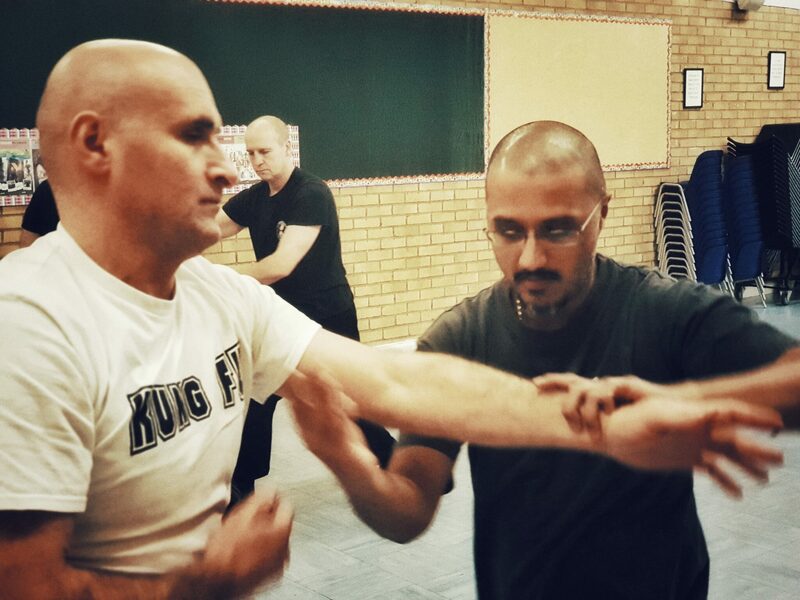 The most difficult thing in Taijiquan sparring training is the Jin of attaching. If (you) are able to attach, then you are able to adhere, connect, and follow. Attaching can be classified into two kinds: the attaching from the body’s not being connected to connecting; and the attaching in that the bodies have already connected and you attach to the opponent’s center to upset his root. Attach (Zhan) and then Adhere (Nian) are two different Jins. 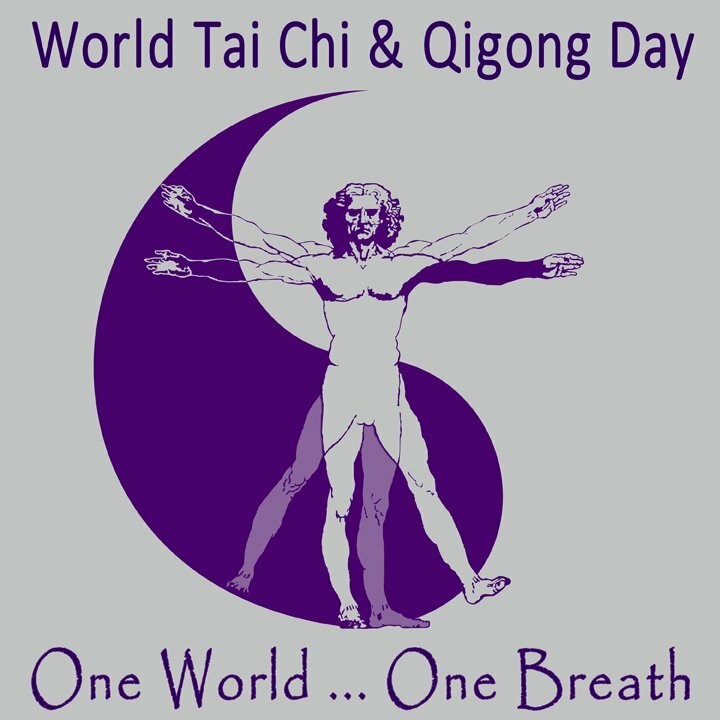 These two Jins are considered two of the most difficult Jins to understand and practice for Taijiquan practitioners. Attaching is an action of contacting and then connecting. Adhering means after contacting, then you stick together. In order to do so, you must maintain your contact and follow your opponent’s movement. It is just like fly paper that sticks on your opponent’s hands and cannot be separated. Attaching can be distinguished into two kinds. The first kind of attaching is to get in touch with the opponent’s body and then connect. Naturally, this is to build up a connection from a separated original position. The second kind of attaching is after you and your opponent’s bodies have connected, then you find the attachment of your Jin to his center and root. 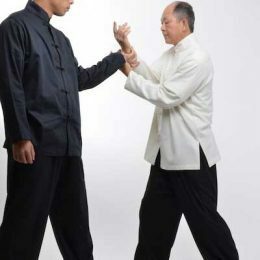 Normally, in Taijiquan pushing hands training, both parties are constantly searching for each other’s center so the opponent’s center can be damaged and the root can be pulled. Once you have attached to this center, you will stick with it, and keep connecting and following. This will place your opponent in an urgent and defensive position at all times. Therefore, this kind of attaching Jin is always associated with Growing Jin (Zhang Jin). Growing Jin is a continuous Jin through which you can attach to the opponent’s center and grow into it until it can be destroyed. “ At the beginning of a fight, the opponent and you do not have any contact. (In this case), even if you have special expertise in pushing hands skills, you still cannot use it. (Therefore), in order to use your pushing hands skills to defeat the opponent; you must first understand how to connect with the opponent with Attaching Jin. (After attaching), then (you) immediately follow with the Jins of Adhering, Connecting, Listening, and Following, thus placing the opponent into a position that allows neither advance nor withdrawal. To apply this Jin, (you) must wait for the opponent’s first attack, then following (his/her) coming posture and attach with it. If the opponent does not attack first, then you must use a false attacking posture to induce (his/her attack). When he emits his hands, immediately attach with them. When you first encounter an opponent, you are not in a connecting position that allows you to apply your pushing hands expertise. Therefore, you must first attach to your opponent’s arms so you can place him into the disadvantageous position for your further attack. The best way to build up this attachment is waiting for the opponent’s attack and then following it and attaching to it. However, if the opponent does not attack first, then you must present a false opportunity, or use a faking action to induce his attack. “ If your opponent and you have built up a connection and his pushing hands skills are not worse than yours, and if the opponent’s Xin is peaceful and his Qi is harmonious, if his Qi moves naturally with the Yi, and if his Jin emits following the Yi, then it will be hard to defeat him. 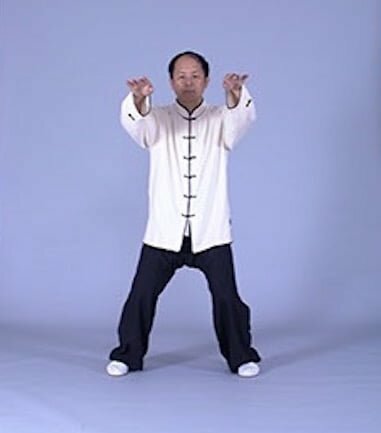 In order to win, you must be able to find his center and connect with it with Attaching Jin to damage his central equilibrium, pull his root, irritate his Xin, and to make his Qi float. However, in order to execute this Jin efficiently, (your) sensitivity exercises of attaching, adhering, connecting, and following must have reached a profound level. 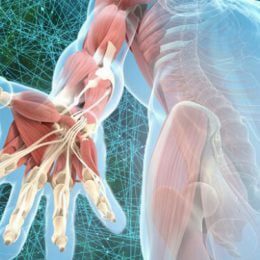 “ What are the sensitivity exercises of attaching, adhering, connecting, and following? Yang, Ban-Hou said: “What is attaching? It means to raise up and pull to a higher position. What is adhering? It means reluctant to part, and entangled with (the opponent). What is connecting? It means to give up yourself, and without being apart from (the opponent). What is following? It means when the opponent is yielding, you respond (with follow). (You) should know that without clearly understanding attaching, adhering, connecting, and following, a person’s conscious feeling (i.e., sensitivity) and movements will not be developed. (In fact), the Gongfu of attaching, adhering, connecting, and following is very refined.” What he said is very reasonable.